My name is Brad Johnson and I live in middle Tennessee. 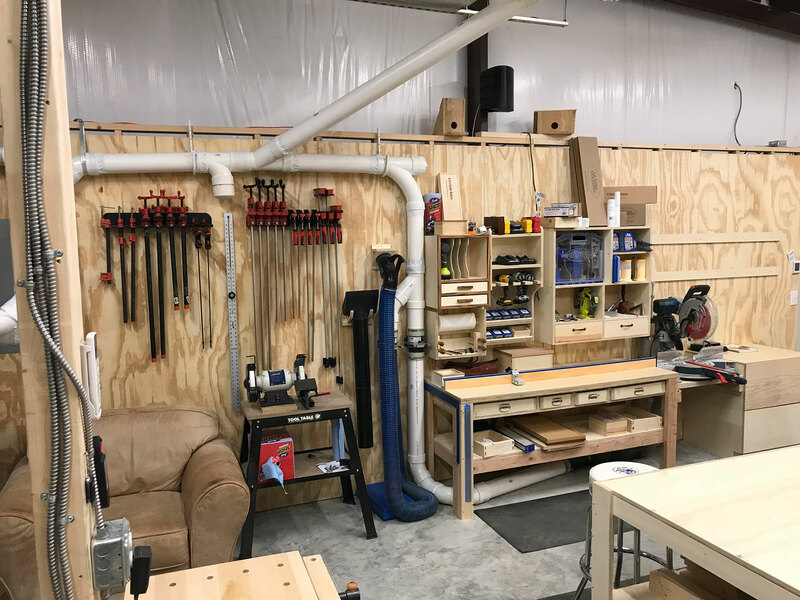 I got into woodworking just this past fall and have gone full speed toward building a great shop. At this point, my shop far outperforms my talent. I mostly make shop furniture and boxes. I’m just trying to get my skills improved so I can create something special. I tell my wife that my 10th or 12th box might be pretty cool… but I still have to make 6, 7 and 8. 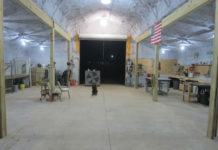 My shop is 25’ x 30’ and is an add-on to an existing metal building I have on some property in the country. 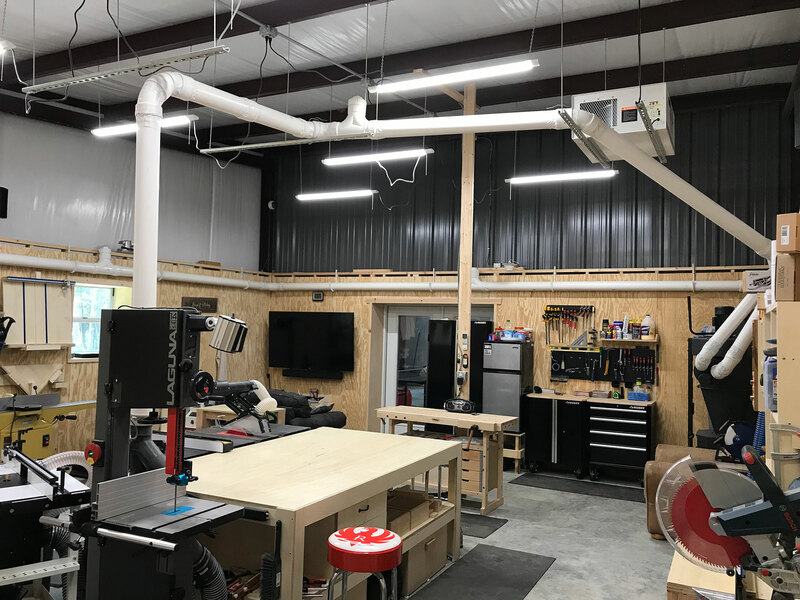 The shop is heated and cooled and I am about to begin a project where we enclose half the barn to expand the shop and have temperature-controlled wood storage. This picture is looking in from the double doors that enter into the barn. There is an additional man-door that enters the shop from covered parking. This cabinet is only temporary, it will move into the expansion space when it is completed. My Laguna dust collection system works really well. I have two branches off of it that cover the room. I used schedule 40 PVC. When designed, the space in front of the clamps was going to be for my future lathe. The big chair and grinder have taken over the space. There’s a good chance the lathe goes into the expansion. I purposely haven’t gotten a lathe yet. I think that as soon as I get one I will do nothing but make bowls for a year or more… I’m holding off so I can make myself keep practicing my other wood skills. 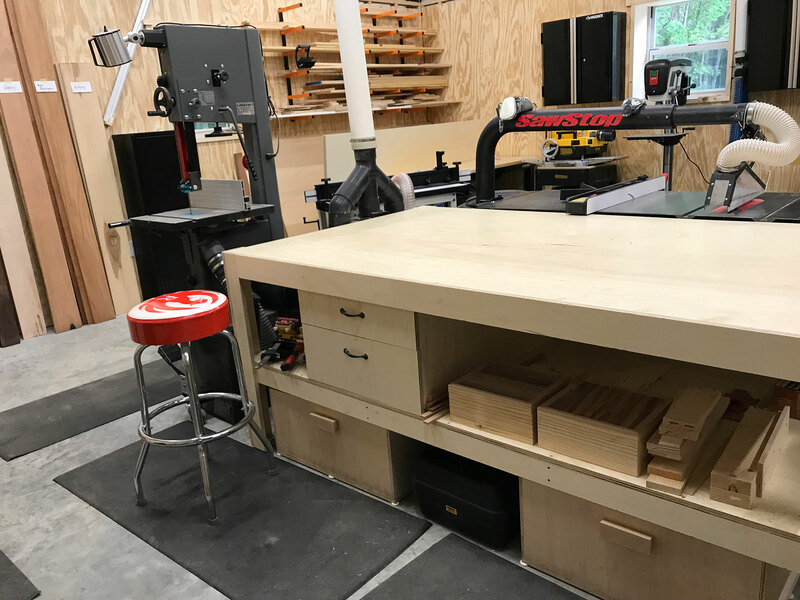 I put a lot of thought into my miter station and watched a lot of videos. 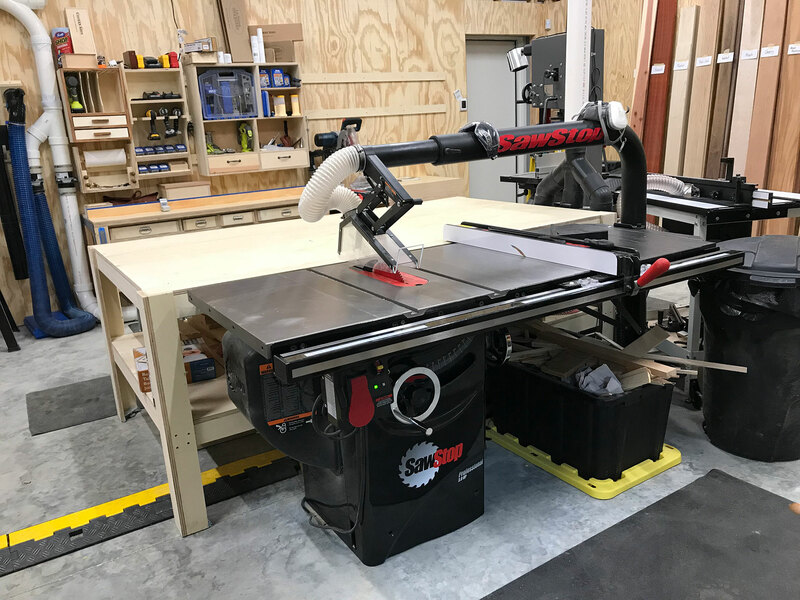 I wanted to have it up and running to help me make easy, repeatable cuts so it had to be simple because I literally had no skills when I made it. Notice, my first shot at drawers were simple boxes in holes… and I left a lot of space (rookie). The tool holders and wall cabinets are hanging on French cleats. I’m planning on a tool cabinet with doors at the end for my growing collection of hand tools. This picture is looking in from the man-door. I wanted to create a flow where wood storage was right inside the door. I’ve just started venturing into using some real wood as my shop furniture is all plywood. I plan to put in some storage where all my new wood is stacked. Yes, I have to label all my wood. I’m new at this. My plan for flow had the planer and jointer next (the drill press found its way into there). The vac system there is made to attach to either tool and the hose stretches 20’ so I can reach everything on that side of the shop. The sanding station works well and this was my second attempt at drawers. I forgot all about drawer fronts! The TV and couch get a lot of use while glue is drying. Moving to the middle, I love my table saw and this is my 2nd outfeed/assembly table. The first one wasn’t quite big enough. On the 2nd outfeed table, I felt like a pro making drawers. Don’t look really close because I had the drawer fronts lined up perfectly but then realized I had to shim out a slide to make the drawer work right. 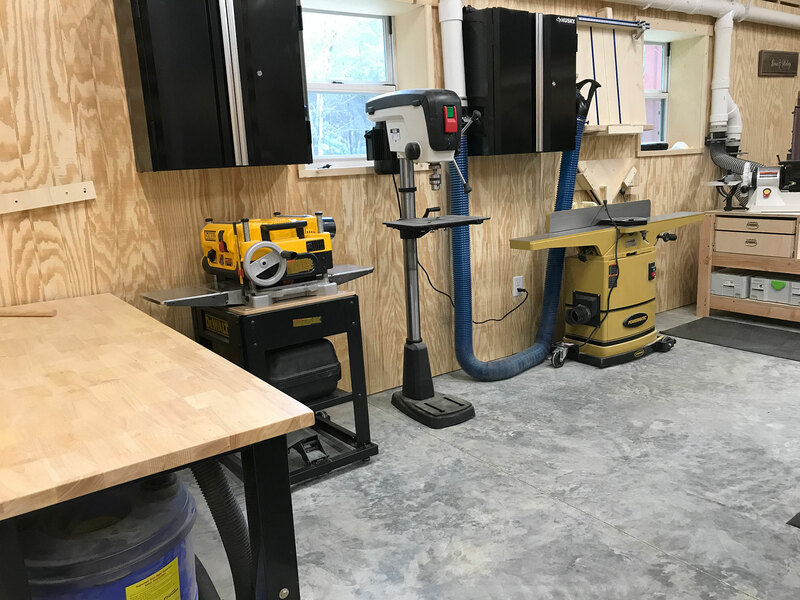 Band saw and router table finish out the middle section. I included this picture just to show the overhead routing of the dust collection. 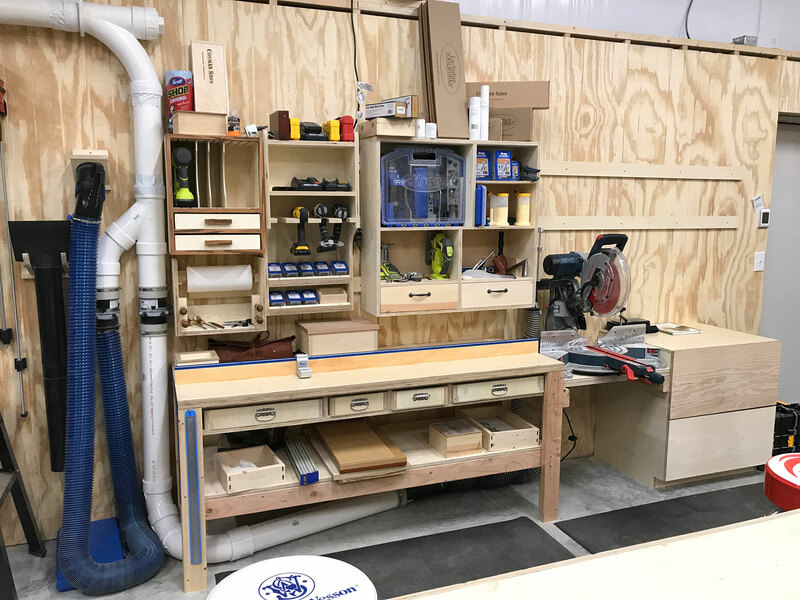 Less than a year and you have a great looking well organized shop already. I have been woodworking for almost 30 years and I am envious of your accomplishments. 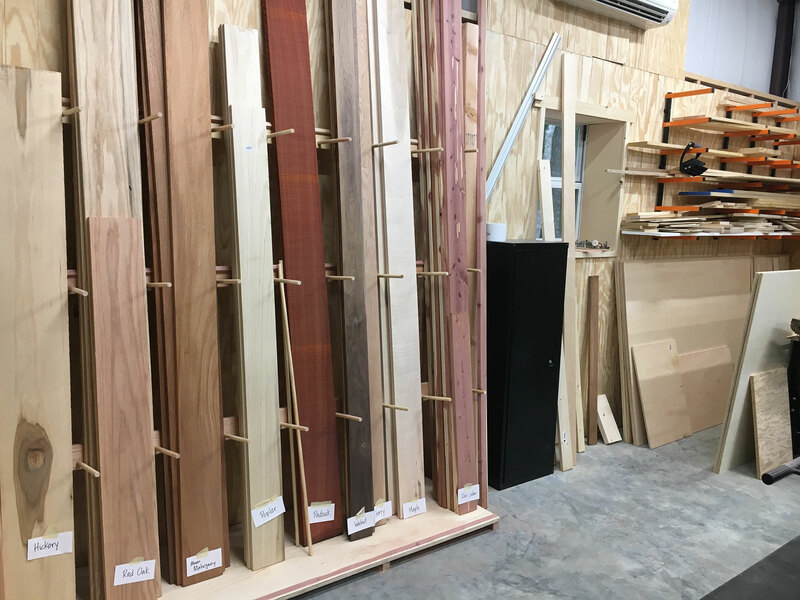 You are taking the right approach creating shop fixtures before tackling honey do projects. Thanks for the tour! Excellent start to your shop. Thoughtful layout which should allow you to build about anything your mind can dream up. Well done! Thanks a bunch for Sharing ! I have a very very small shop and have cramed in alot of stuff into a small space using casters all around. I definitely noticed that for several machines you chose as i did. I am also a newbie. I am having a tough time getting my jointer to work properly (that is a 54HH right?) , perhaps at some point you might wish to do a video on that so i might gleen some tips from you. I also have the same bandsaw and would love to know which way you decided to lay your blade on the top wheel. Some say place the center of the blade in the center some say place the trough of the blade in the center. Also noticed you’re in Tennessee….have you been there your whole life or recently moved? I’m in NY and the cost of living is high. Tennessee is a place i was looking at to possibly move to. Would love your take on it. Thanks again for sharing ! That sounds great Jay but do you worry at all about flooding or tornadoes and such? i’m also into hiking so i’m wondering if there’s much there for that kind of thing? If you had to give Cons for the area what would they be? Thanks for the reply! P.S. Are you and Brad close to each other? What parts of Mississippi and Tennessee are you guys in? Thanks, Bryan. Mississippi may have us beat on cost of living but Nashville has a lot going on right now. It is definitely an “it” city with tons of work to be found and still a great “small city feel”. I’ve been here 20+ years and I love it. I went with the non-helical heads on my jointer. I was buying quite a bit of equipment over a 6 month span so I took the savings where I could. I guess the first time I miss a nail and hit one of those heads that will be some money that I will have wished that I spent. I’m not in a place yet to give much advice or instructional videos but mine has worked perfectly since I brought it home. I do have a guy that works at the local Woodcraft store that helps me with my set ups. That probably goes a long way. For the bandsaw… good question… I don’t remember what I did! I’m actually replacing the blade this weekend so I’m curious now why I don’t even remember that dilemma. Paul, I know of Snodgrass and thats why I was wondering what Brad does. I may in the future consider switching guides to the guide he sells and remove the bottom guide to make it so much easier to adjust the blades. Seems much more convenient. But since i’m not using the saw that much at the moment its not a priority. Great start to your shop. thanks for sharing. Thanks again for thew tour. Looking forward to the next one after the expansion! thanks for that tip! I wasn’t sure about the white tape (If I needed it or if it would help) but I’m going to look into your method. Thanks again. Nice shop. I am a new wood worker also. I like your skill description “my shop out performs my talent”. I am going to use that! Jays Custom Creations will help us equal that out. 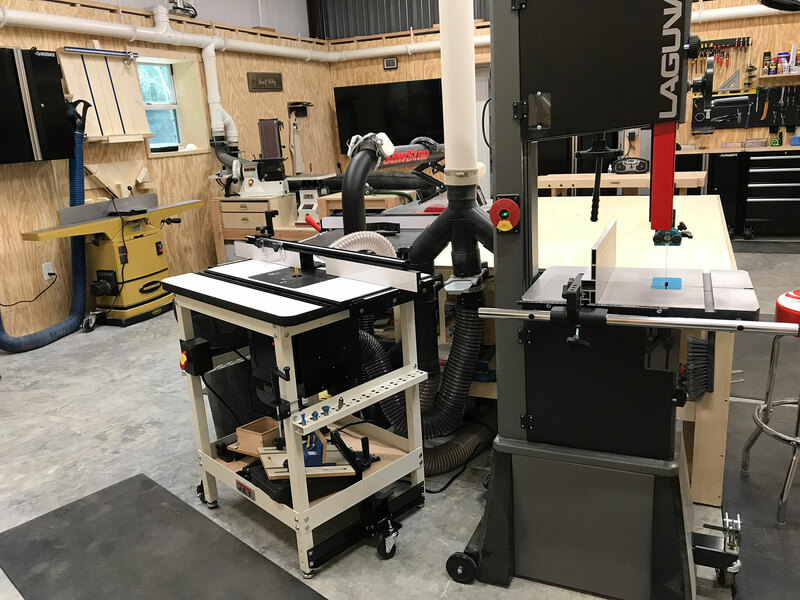 Awesome shop setup. Appears you are starting with the right equipment and your talents will grow. Probably a good thing that you won’t pick up some bad habits trying to work around poor equipment. Enjoy your time in the shop. Awesome shop! I’m slowly getting mine setup but I’m having a hard time figuring out where I want everything. I am also in Tennessee too! Go Vols!!! Eric, I laid out my space on grid paper and included the door locations then cut out pieces of paper to represent the tools that I knew I wanted. I colored them and covered them in tape.. then spent about 4 days moving them around the shop drawing until I felt that I had a good design. Once the concrete was poured, I drew them on the concrete with chalk so walk around them. Maybe that helps? Good luck! Great shop. Jay, I love this new(ish) shop your Tuesday series. It gives all of us to see what others shops are like. Shop looks great! What is the coating on your floor? We miss middle Tennessee (Nashville – Hendersonville)…lived there for 10 years. In Michigan now….grandkids!! Just a concrete floor. We poured it just before it got cold so I’ve wondered if that gave it some character. But no cracks so far! I spent my first 21 years in Michigan but the last 21 in TN. I still don’t miss the snow. Beautiful Shop. Wish I had the space and the cash to build a shop like that. Really fantastic. Very well laid out. 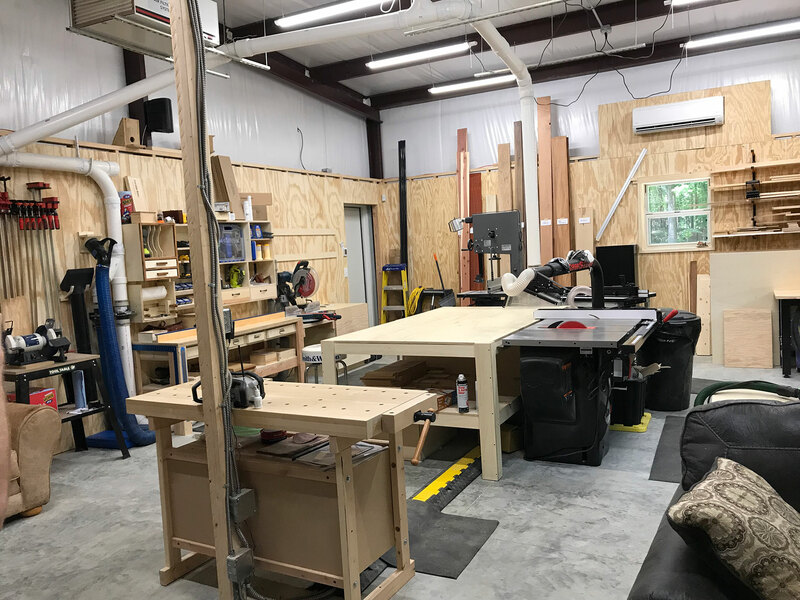 I’ve been doing some kind of wood work for about 25 years and I have never had a shop like that,and that is a very good compliment. 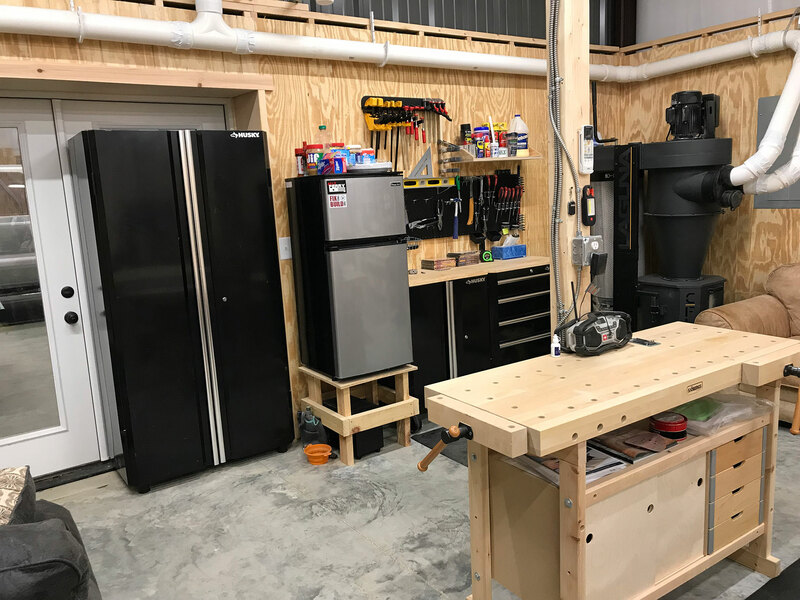 Awesome shop to build something cool! I’ve been in Brads shop and it is as great as it looks. Good pro-level machinery and a/c in a shop is great. Your shop looks great especially compared to mine. Mine looks a lot like a storeroom. Anyway, your off to a great start and your doing it right. Great job. GREAT work for a “beginner”! Man! That’s a big investment for a hobby you just started. I have been a woodworker hobbyist since childhood (1946 vintage). I started out by taking apart “orange crates”, then reassembling into a chair or whatever. I collected tools as needed over a lifetime – same for my wood inventory. Thanks, Chuck! You know, this is my 2nd outfeed table. The first one was a bit smaller and since it doubles as an assembly table I wanted the extra room. I did use a router on the first table to extend my miter slots but my OCD has gotten the best of me and I haven’t brought myself to cut them into the new table. I’m considering just cutting the legs down slightly on the outfeed table. 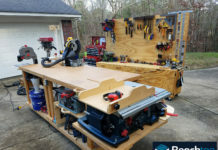 My sled doesn’t have to travel very far onto the outfeed table and I’m thinking it won’t make a big difference. Still undecided on that one. Great shop Brad. I wish I had that much space. 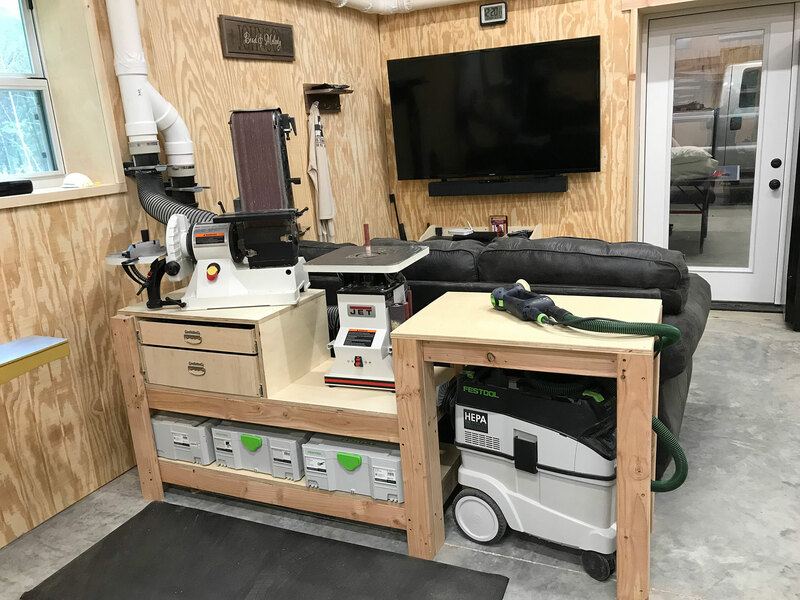 I’m a retired truck driver and just getting started making a shop in my basement. I’ve been putting off making drawers and base cabinets until I think I won’t totally mess them up. You make me feel like a coward. I’ve been in my house for almost a year, and I don’t have the guts to invest in my shop like I should and start a real income earning shop. Also I dove into honey-do projects and its made things tough to complete because the shop isn’t work ready. I spend to much time on Shop Slide Puzzle. Move this to move that to slide that into that space to work. Ugh. Hi Brad, that’s a great shop you have! I am a fellow Tennessean living near Gladeville. 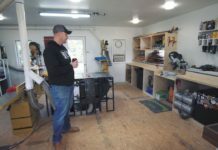 I find your shop layout very interesting as I am in the process of setting up my shop in a 40×50 garage. I’m hoping to cross paths with other woodworkers in the area as I get set up and run into problems. I, too, look forward to starting out building boxes to hone my skills. Best of luck on your journey. Maybe we might cross paths soon. Mike, my shop is only about an hour from you. If I can be of any help you can email me. Only thing I would change would be adding a Wixey digital readout to the table saw. Amazingly useful. it will let you make +- 0.001″ accurate cuts time and again and for only about $100. No table saw should be without one.